When I was nursing The Boy and going back to work, I was worried about supply and pumping enough for him while I was away. 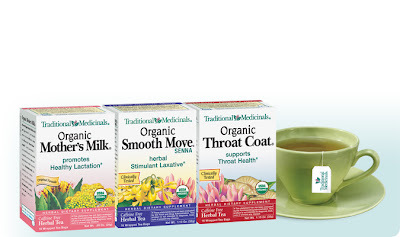 One of the things I did was start drinking a tea by Traditional Medicinals called Organic Mother's Milk. The more I looked in to their teas and tried them, the more I found that I enjoyed them and could use them in my every day life. During the winter, I am especially fond of their Organic Throat Coat and Organic Cold Care, as well as Organic Echinecea teas. During the winter months, you can find a seasonal sampler of their cold teas, which is nice for trying them out. I'm not sure how many people I have recommended these teas to over the past few years, but I know that some do enjoy them, so I'm not alone! I love the raspberry leaf tea while pregnant, too.